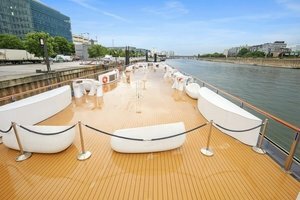 This lovely boat space is docked directly across from the Eiffel Tower. It is perfect for brands looking to host a Product Launch or Corporate Event. 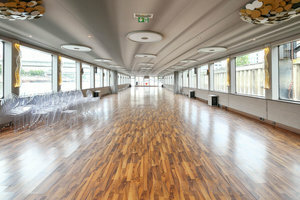 With two levels comprised of a long and elegant event space below and an open air deck up above, this space can host a variety of events. 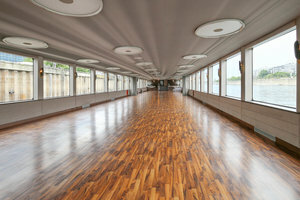 The interiors are comprised of windows spanning the length of the boat, parquet wooden floors and unique recessed circular lighting, all of which give the space an elegant feel. With facilities including a stock room, furniture and counters this space can accommodate a range of creative pop-ups. This boat is docked next to the 16th arrondissement but has the ability to travel through Paris via the Seine. It is a great opportunity to host an unforgettable event.